Q1. I can power my home entirely with solar power. Probably False. The typical system isn’t large enough to power an entire home, but it can help reduce monthly bills. On average, GVEC members save $80 to $100 a month with a 8kW system, which can produce approximately 1,000 kilowatt-hours (kWh) per month. That’s about two thirds of the 1,500kWh consumed monthly by the typical home in the GVEC area. Q2. Solar energy is only used during the day. True. Solar energy must be used as it is produced, which means during daylight hours. Any excess energy that is produced and not used is sold back to GVEC at the current wholesale price. Although battery storage technology has improved, it’s still too expensive for most homeowners to consider. Q3. Solar panels produce better on hot, sunny days. True. However, solar panels still produce well with a slight overcast. Q4. It takes sunlight 12 minutes to reach Earth and make contact with solar panels. False. It takes a little over eight minutes for the light to make contact with your solar panels. Q5. If I have solar panels on my home, I will still have power during an outage. False. During a power outage, solar panel systems are automatically shut down to prevent back-feeding into de-energized utility lines. It’s a safety precaution to keep linemen safe as they work to restore power. Q6. 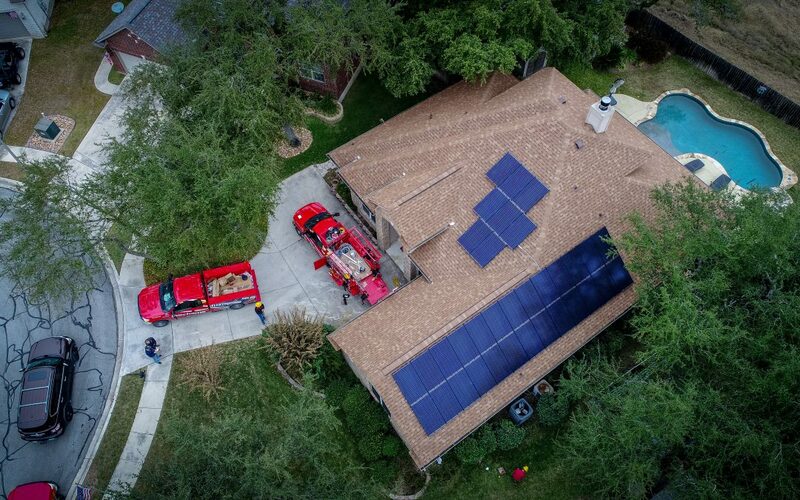 You don’t have to be a GVEC member to purchase a GVEC solar panel system for your home. True! GVEC members and nonmembers, alike, can purchase a GVEC solar panel system! Q7. All solar panel systems are installed the same way, so it doesn’t matter who you hire. False. Installation practices, which can differ from one company to another, can make a big difference when it comes to durability and longevity. Be sure to compare apples to apples. At GVEC, we take pride in the systems that we design, aiming to exceed our customers’ expectations. Q8. Homeowners in the U.S. break even after purchasing a solar panel system in 8-12 years. True. With GVEC solar pane systems, members are seeing payback periods between 8 to 12 years. The timeline ranges, depending on the energy rate cost. Lower energy rates equal longer terms of payoffs. GVEC’s rates are lower than many in Texas and the U.S.
Q9. To “go solar,” homeowners must have solar panels installed on their property. False! There is now the option of community solar—the idea of installing a massive solar farm from which hundreds or even thousands of people can source their electricity. GVEC’s SunHub™ Community Solar program generates solar energy locally and allows members to sign up to purchase up to 500kWh per month of its renewable electricity. How did you do? Does your energy expertise rank as a solar hero or a solar zero? To learn even more about GVEC Solar or GVEC’s SunHub™ Community Solar program, visit gvecSOLARservice.com.